Greenville, S.C. (April 23, 2018): The Center for Developmental Services (CDS) was selected as the beneficiary of a Girl Scout Silver Award project. 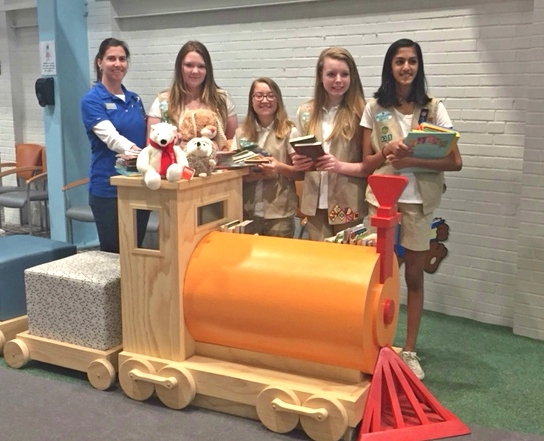 Cadette Troop 831 of Service Unit 635 donated books, therapy toys, puzzles, and games to be used by children with developmental delays who are served by CDS partners. The Silver Award is Girl Scout’s second highest honor, and a pivotal step in leadership for Cadette level scouts in 6-8th grades. Pictured L-R are: Dana McConnell (CDS Executive Director), Courtney Taylor, Sarah Lamb, Paris Adams, and Shwetha Rajmohan.